Learning how to cook quinoa is a great way to add a delicious, whole-grain side-dish to your repertoire of vegetarian recipes. You'll be pleasantly surprised to find out just how easy it is to prepare this tasty, healthful grain. The first step in cooking quinoa is to soak it for a little while before cooking it to break down the hard outer shell on the individual quinoa grains. Once you have done that, you'll find that preparing this grain is very similar to cooking rice. While it's not dangerous to eat quinoa that hasn't been pre-soaked, the flavor will be quite bitter. Quinoa that has been soaked properly will have a light, nutty flavor. Fill a clean saucepan with 1 ½ cups of cold water. Add one cup of quinoa. Allow the grain to soak for at least 15 minutes to half an hour. Once the soaking time has passed, very carefully drain off the water using a colander or sieve. Give the grain an extra quick rinse under the tap, again draining the rinse water. Keep rinsing until the water runs clear. Return the pot to the stove with the drained quinoa inside. Add 1 ½ cups of water or vegetable broth. Bring the mixture to a boil, giving it a little stir. Place a tight fitting lid on the pot. Simmer for 20 minutes. Do not remove the lid while the quinoa is cooking. Remove from heat after 20 minutes, but don't remove the lid. Allow the pot to stand for at least five minutes. Add additional seasonings to vary the flavor, such as basil, oregano, garlic and other savory flavoring agents. 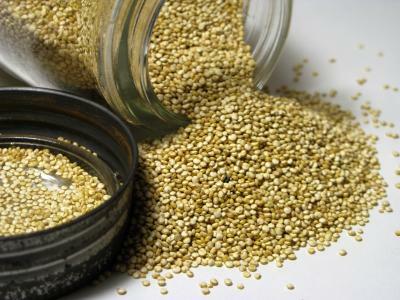 Cooked quinoa can be used like rice in recipes for casseroles, pilafs, and risotto-like dishes. Quinoa loaf can be a great vegetarian substitute for meatloaf. Make quinoa stuffed bell peppers. Combine quinoa with black beans, corn, onions and a zesty dressing for a nice vegan salad. Mix cold prepared quinoa with shredded carrots, beets and a sweet dressing for a light summer salad. Mix quinoa with oatmeal and fruit for a tropical breakfast treat. Use quinoa as part of the stuffing mixture for vegetarian stuffed grape leaves. Add quinoa to your favorite protein smoothie recipe as a way of boosting the fiber and protein content. Quinoa is such a versatile dish that you'll likely want to serve it quite often once you learn how to prepare it - and you'll probably start working it into your meals in a variety of different ways. However you choose to serve quinoa, you're serving up a dish full of healthy, protein-packed vegetarian delight.